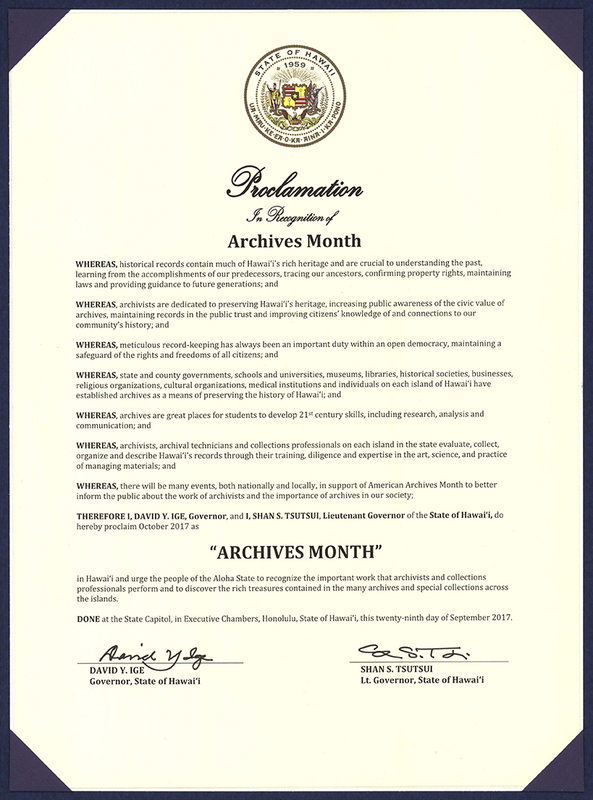 Started in 2006 by the Society of American Archivists and supported by the Council of State Archivists and National Archives and Records Administration, American Archives Month is a time to focus on the importance of records of enduring value and to enhance public recognition for the people and programs that are responsible for maintaining our communities’ vital historical records. 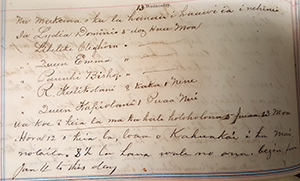 Archival records are essential in supporting society’s increasing demand for accountability and transparency in government and public and private institutions. They protect the rights, property, and identity of our citizens. In the course of daily life, individuals, organizations, and governments create and keep information about their activities. Archivists are professionals who assess, collect, organize, preserve, maintain control of, and provide access to this information that have lasting value. Archivists keep records that have enduring value as reliable memories of the past, and they help people find and understand the information they need in those records. These records, and the places in which they are kept, are called “archives.” Archival records take many forms, including correspondence, diaries, financial and legal documents, photographs, video or sound recordings, and electronic records. An archives serves to strengthen collective memory by creating a reliable source of information and provides access to an irreplaceable asset – an organization’s, government’s, or society’s primary records. Archivists bring the past to the present, they are records collectors and protectors, keepers of memory. They organize unique, historical materials, making them available for current and future research. 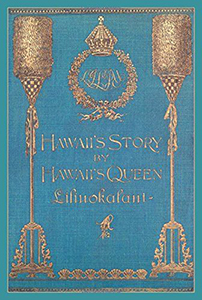 Cover of original printing of Hawaii’s Story by Hawaii’s Queen Liliʻuokalani. 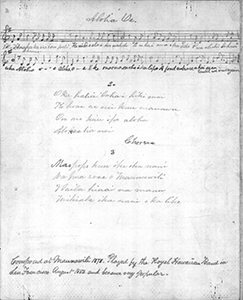 Original Aloha ʻOe written by the Queen’s hand. 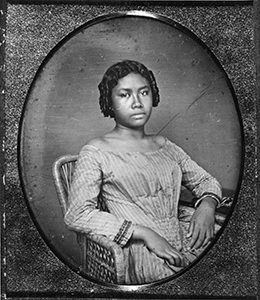 Picture of Liliʻuokalani at age 15. 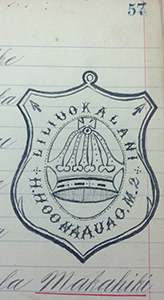 Close up of an entry in Liliʻuokalani’s 1875 diary. 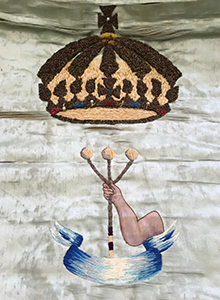 Close up of Queen Liliʻuokalani’s Education Society Banner. What is Electronic Records Day? Electronic Records Day is an event sponsored by the Council of State Archivists (CoSA) as part of its State Electronic Records Initiative (SERI) to raise awareness among government agencies, related professional organizations, the general public and other stakeholders about the crucial role electronic records play in our world. 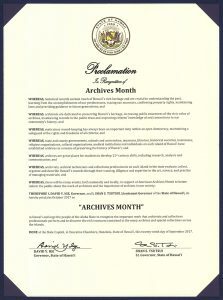 In celebration of Electronic Records Day, Hawaii State Archives would like to share with you some resources to help you manage electronic records. 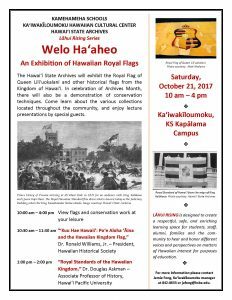 In partnership with Kamehameha Schools and as part of the Lāhui Rising series, the Hawaiʻi State Archives will exhibit the Royal Flag of Queen Lili‘uokalani and other historical flags from the Kingdom of Hawaiʻi. In celebration of Archives Month, there will also be a demonstration of conservation techniques. Come learn about the various collections located throughout the community, and enjoy lecture presentations by special guests. 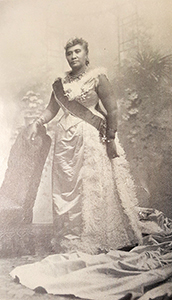 This year marks the 100th anniversary of the passing of Hawaiʻi’s last reigning monarch, Queen Liliʻuokalani. 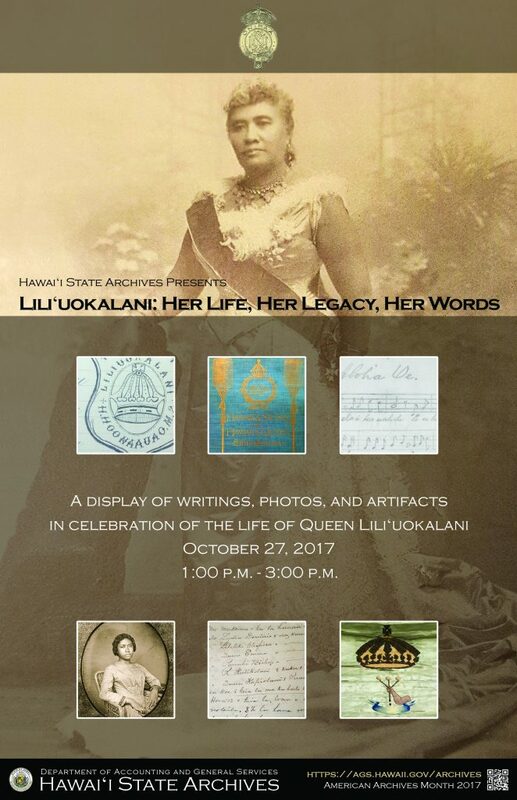 It is from her tireless efforts on behalf of her people that we draw our inspiration for this year’s theme: Liliʻuokalani: Her Life, Her Legacy, Her Words. 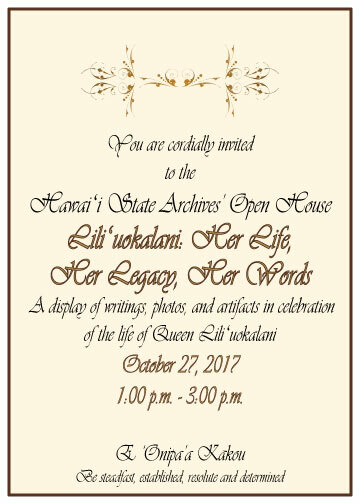 On October 27th, we conclude our American Archives Month celebration with a public open house in which we will be displaying a selection of original writings, including her published autobiography, from the Queen’s own hand as well as photographs and artifacts from her life. 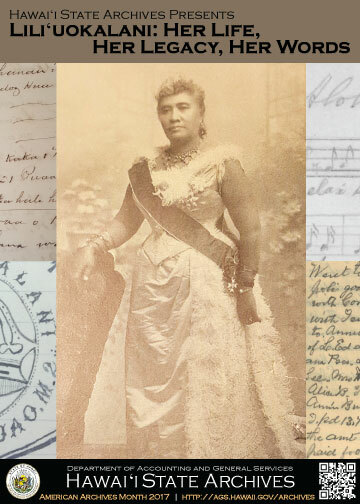 This exhibit will highlight the Queen’s continuous efforts throughout her life to provide a better world for the people of Hawaiʻi; with particular emphasis on her educational society, philanthropic efforts, work for gender equality, and music compositions. Please join us in remembering the life of this remarkable woman who, throughout her life, exemplified by her motto: E ʻOnipa‘a Kākou (Be steadfast, established, resolute and determined).